Last night, I didn’t sleep well and when I checked with others from my group in the morning, a couple of people had similar complaint – let’s blame it to Diamox. Our morning starts early with now familiar routine, porters come to pick up our luggage as we are getting ready for the breakfast. After a hearty breakfast of our usual combination, we are ready to hike to Tengboche. We go through the same narrow steep stairs of Namche Bazaar streets retracing our steps from yesterday till we reach the sign splitting the trail to Tengboche and Khumjung. The trail up to Namche Bazaar is well-traveled with stone paving & steps in parts of the trail, particularly near villages. After living Namche, I noticed the trail becoming narrower and less maintained. The higher elevation and lower oxygen level is very noticeable as we head towards Tengboche. After the first two days on the EBC trek as a group, a pattern starts emerging where Doctor, Varun, and Rush are generally ahead of the group with our guide Deepak and the rest of us are trailing behind with Tshering. If we don’t catch up with them at the rest stop, we connect at the lunch place. Tibetan Aum (or Om) Pendant. On our return trip from Khumjung, I bought a beautiful sterling silver pendant with black inlay depicting Tibetan Aum (or Om) for myself. The lady who sold me that was so nice she strung it on a nice black cord for me to wear it immediately – and I have not parted with ever since. Everyone in our group liked it, and I thought to buy another one for my wife, so we stopped at several shops on our way to Tengboche but could not find it. So I settled with a different style in turquoise blue color with matching earrings for my wife – and she loved it. We even tried it find it in Kathmandu on our return trip but no luck – it must be an odd single piece. Today is Dashain. It is the longest, most auspicious, and most anticipated Hindu festival in Nepal, Bhutan, Burma and North Indian hills. Dashain symbolizes the victory of good over evil. During the 15 days celebration, most Nepalese from cities like Kathmandu take time off to visit their families and friends to their ancestral villages. 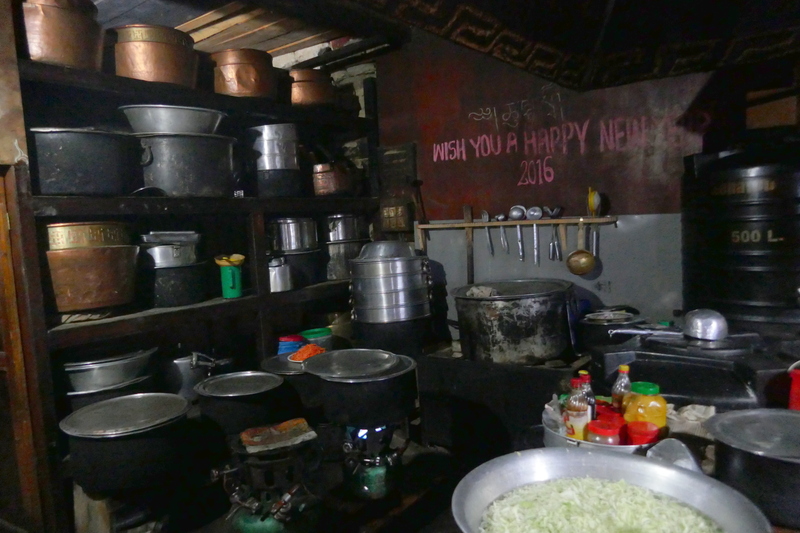 When we returned from the EBC trek, we noticed roads were empty and some restaurants had signs asking people to serve themselves as their staff was off to Dashain holidays! While hiking to Tengboche, we saw Nepalese military celebrating Dashain festival by a celebratory procession through the town. My guide said they are probably heading to a temple to perform religious rituals. The trail leaving Namche Bazaar is relatively flat (“Nepali Flat”) and follows the long ridgeline of the mountain range with the river and valley on the right side. Every turn reveals spectacular views of the valley and mountain from a high vantage point. Our “day-packs” porter with fitting “always smile” sweater. Trail along mountain ridge-line disappearing in Himalayan mistic abyss. Looking at the picture above, it may look like an easy-going flat trail but with the lower oxygen at this elevation, it felt strenuous and I took several breaks. Here is a small clip of the beginning part of this trail. We ran into a group of Sherpa’s at one of the rest spots and had an impromptu folk dance session on popular Nepali tunes. After all, today is Dashain so let’s celebrate! Stupa and Dzopkyos with colorful cargo. The Stupa was decorated with bright yellow-orange and red colors with prayer flags stretching in all directions towards the mountain. 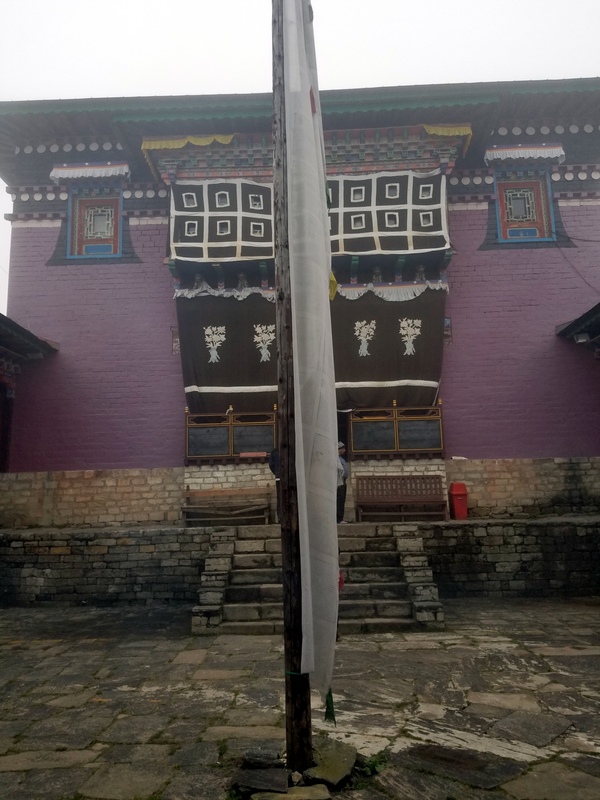 The Buddhist prayers flags are always in fiver colors, Blue, White, Red Green, and Yellow. 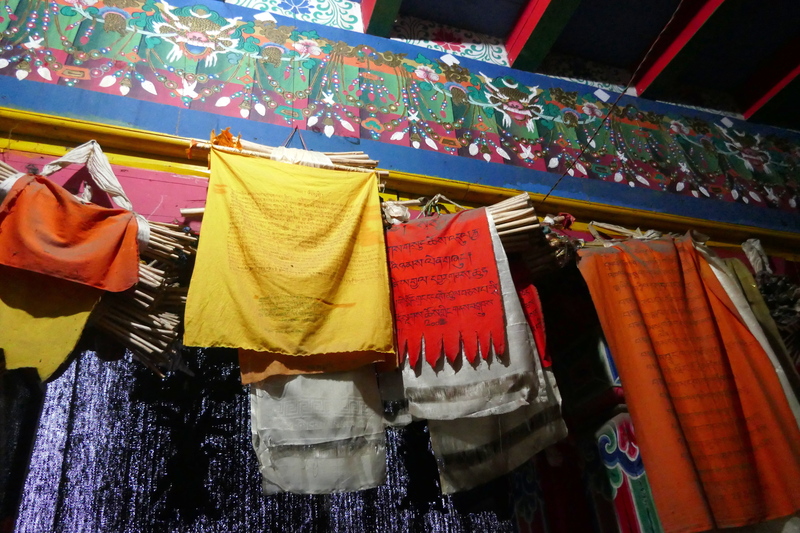 According to Buddhism, the fiver colors of the prayer flags (and other Buddhist religious curios) relate to the five elements. Blue symbolizes the sky and space, white symbolizes the air and wind, red symbolizes fire, green symbolizes water, and yellow symbolizes earth. According to Traditional Tibetan medicine, health and harmony are produced through the balance of the five elements. The highest point of Buddhist Stupa symbolizes crescent moon for compassion (masculine principle), sun for wisdom (feminine principle), and a jewel at the apex for enlightenment. We were often challenged by the Yak or Dzopkyos (Yak-Cow hybrid) train coming from either directions. 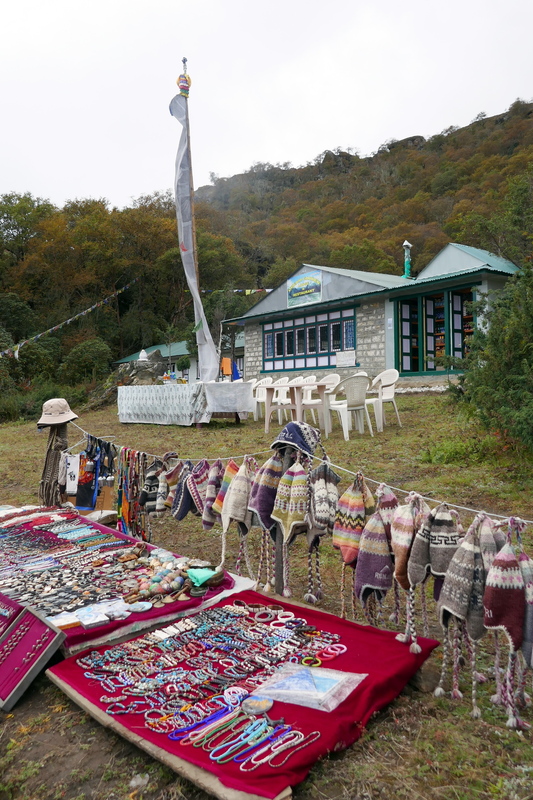 Due to narrow trail with steep mountain on one side and a deep valley on the other in some section of this trail, you have to find a right spot on the mountain side when you hear the yak bells. Fortunately, you hear the distinct and soothing sound of the yak bells from quite a distance in this calm Himalayan valley and have plenty of time to find safer grounds. While I was taking the above picture, and following video (which is one of my favorite clips from this trail) Kamlesh was on a safer ground higher up on the mountain side.Doesn’t he look like a Himalayan yogi seating cross-legged in meditation posture? After about 15 minutes I came across two large sign-boards and an elderly sherpa man standing next to a donation box with a Buddhist prayer rosary in one hand. The first sign had Spanish and French translation and the other one was all in English. According to the signs, a man named Pasang Lama Sherpa from Namche Village has been maintaining the main trail to the Everest Base Camp for a long time and was seeking donations from the trekkers. I am not sure who is responsible for maintaining the trails in this region but according to my guide, Pasang has been involved with some trail restoration work for many years so I donated some money. We did see some workers repairing trail before th signs so there was something happening. Here is a small clip of Doctor donating some money. We had a GoPro camera mounted on a backpack (using PeakDesign capture clip) carried by one of our guides and it worked out pretty well. Appeal for Donation to maintain trails. Pasang Lama Sherpa seeking donation. 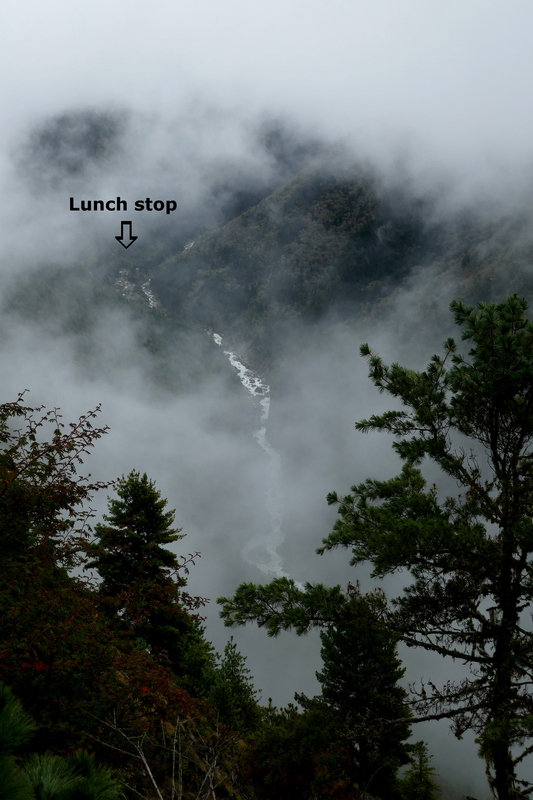 Around the corner from the donation stand, we came to a vista point overlooking the valley with the river and a small hamlet along the river way up there on the other side of the mountain.While I was taking photos, Tshering casually said, “Oh.. that’s where we will stop for lunch”. What?? I almost had a mild heart attack. Lunch ? There? I asked to confirm. Yes, that is Phungi Tanga village and we will eat at a riverfront restaurant there, he confirmed. Now that I am an “experienced” EBC hiker, I know one thing that when there are two places on different mountains, separated by a deep valley (and generally a river), you will be loosing all the elevation to cross the river and will be climbing steep uphill to regain the elevation. So, on the EBC trail going downhill is an early warning sign for upcoming steep uphill climb. Relax, enjoy, and keep marching. While I am often struggling on this part of the trek, locals and sherpa porters are carrying heavy cargo without loosing a breath. They carry this load in bamboo baskets balanced by only one head strap, often wearing flip-flops. 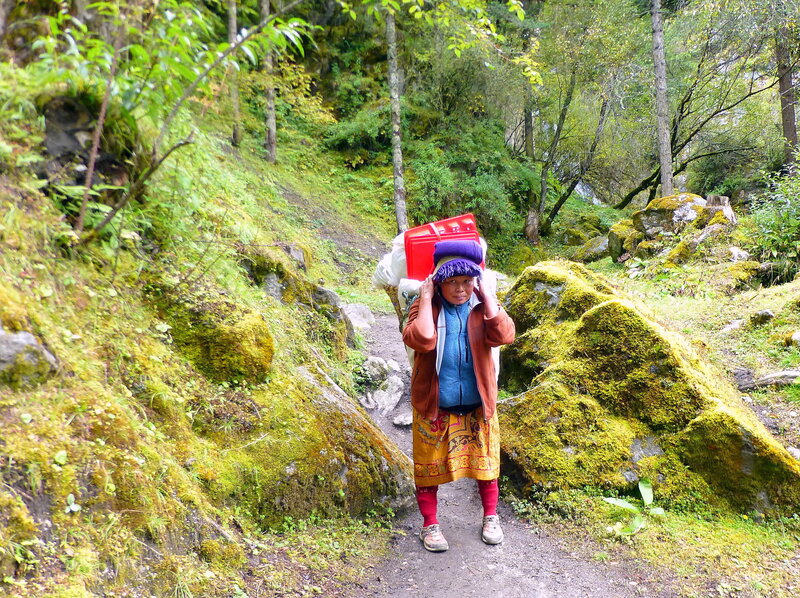 There are several stone platforms along the trail providing resting stops for porters and hikers. 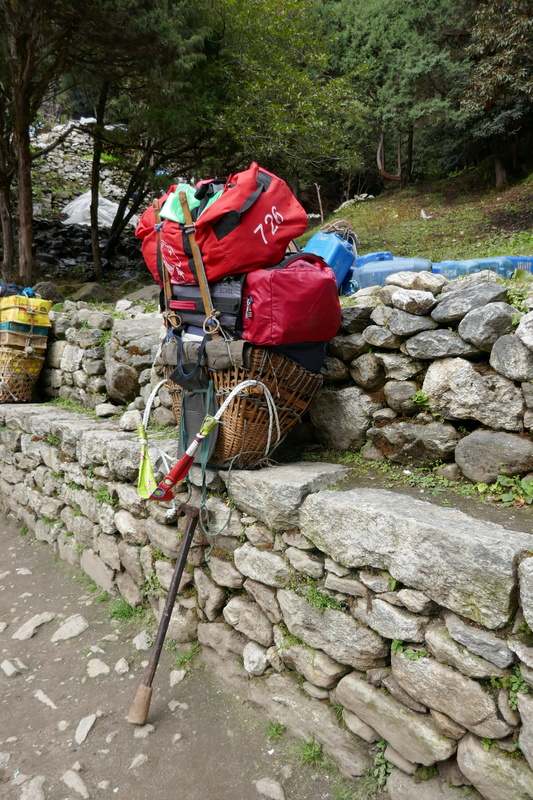 Porters use a short wooden stick with a wide handle as a walking pole as well as a stand to rest their cargo when taking a break on the trail when there are no rest platforms. It was a humbling experience to see them working hard to earn a living, with a smile on their face. 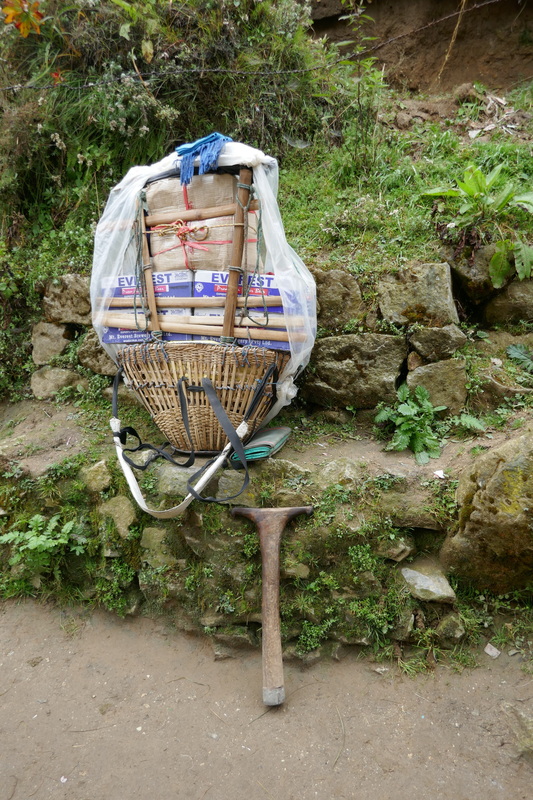 Legally, the Nepalese government has set a 30 kg weight limit for the porters but I don’t think it’s strictly followed. Having worked in Environmental Health and Occupational Safety field in the US, I can certainly tell that this is not a safe working condition. If there is one thing I can do to improve this situation, it would be designing an ergonomically safe cargo carrying sack for the porters. At about the halfway from Namche Bazaar to Tengboche, I came across a sign at a trail junction pointing towards Gokyo, Tengboche, Khumjung, and Namche Bazaar. Gokyo provides an alternate to EBC trek and is also a popular destination for the Himalayan trekkers. I guess I need to come again for this trek. As we go towards the river to cross the bridge before our uphill climb to Tengboche, the landscape changes to lush green with moss-covered rocks, colorful wild flowers, and dense shrubs. I tried to look up the name for these flowers but could not find it – any idea? Wild flowers seen for the first time. Before crossing the bridge, we pass through small villages, Kyangjuma & Lausasa, etc. with all too familiar giant prayer wheel at the entrance of the town, gift shops, restaurants, a beer bar, and a bakery cafe! Glacial Lake Outburst Flood (GOLF) Sign along the trail. At several locations on the EBC trail (mostly along the river), I saw large signs with a map showing evacuation areas in the event of a Glacial Lake Outburst Flood (GLOF). A glacial lake outburst flood (GLOF) – is a type of outburst flood that occurs when the dam containing a glacial lake fails. GLOF events have been occurring in Nepal for many decades. A recent study done by ICIMOD and UNEP reported 20 potentially dangerous lakes in Nepal. In ten of them GLOF events have occurred in the past few years and some have been regenerating after the event. In light of April 2015 Nepal earthquake that killed thousands of people and caused wide scale property damage in Nepal, the GLOF risk management plan is very important for the well beings of locals and visitors along the EBC trek. Soon I see a small bridge with prayer scarves over Dudhkosi river tucked into a narrow valley, by now a familiar sight on the trek. Suspension bridge over Dudhkosi river on the way to Tengboche. When you see yaks coming from the other side, you wait till they cross the bridge before attempting to share it with them. I know, because I was stuck once. Varun and Rush crossing a bridge on the way to Tengboche. We stopped for lunch at “Riverside Restaurant and Lunch Place” in Phungi Tanga town that, when I saw from the other side seemed beyond my reach. Such small accomplishments give a sense of achievements and boost self-confidence – much needed for this trek. After a nice & relaxing lunch break, we get ready for the final stretch of the day – hiking up hill to Tengboche. 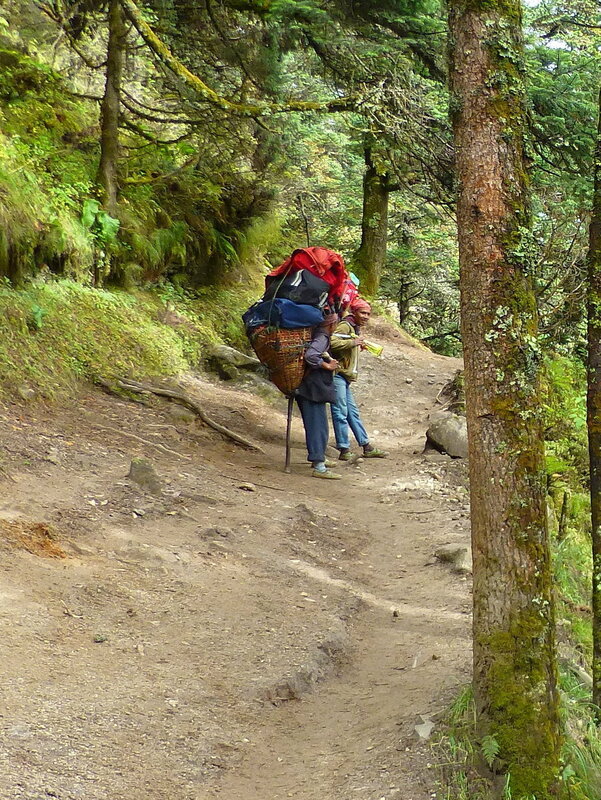 The last lag of the climb into Tengboche is fairly steep but not as long or strenuous as previous days. Varun admiring the view. You can see the trail we took on the other side of the river. It took us a little over 2 hours to reach Tengboche negotiating our way through yaks on narrow uphill trail. 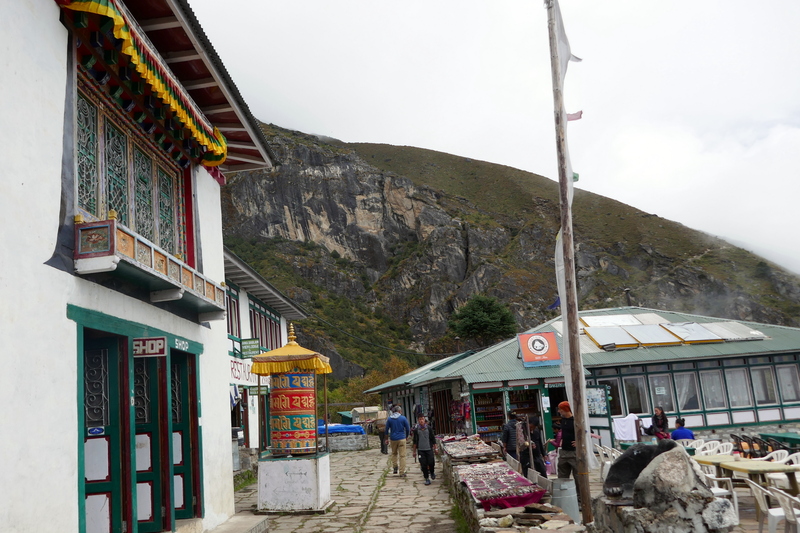 I see more yaks as opposed to Dzopkyos beyond Namche Bazaar – perhaps due to higher elevation and colder climate. Who knows? 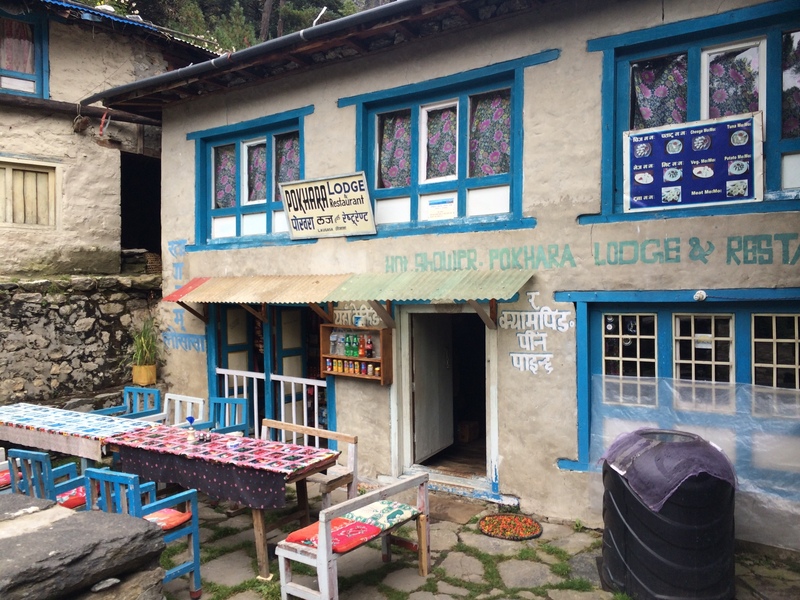 We arrive at Hotel Himalayan right across the famous Tengboche Monastery around 3:30 pm. We dumped our stuff in our rooms and headed straight to the monastery before it gets too dark. 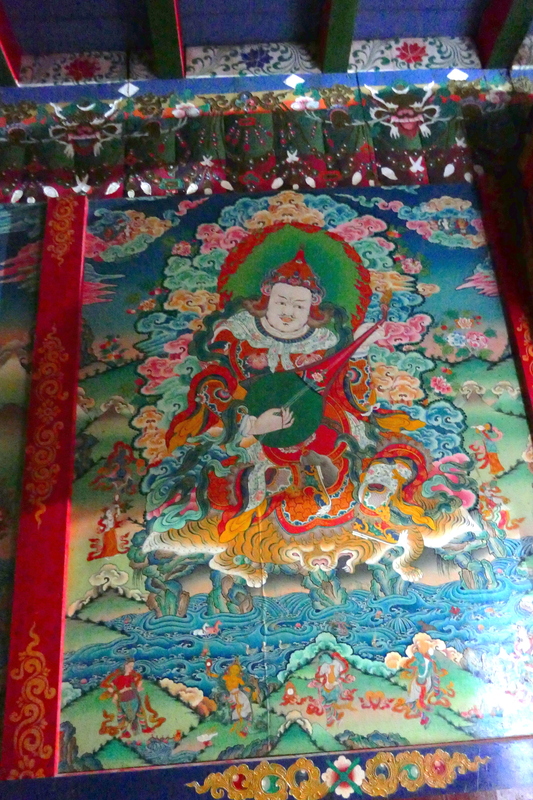 Tengboche Monastery was built 100 years ago (in 1916) and was rebuilt two times after it was destroyed in an earthquake (1934) and fire (1989). It is a UNESCO World Heritage Site and has been featured in numerous movies and documentaries. Our group at Tengboche Monastery. The monastery is the largest Gompa in Khumbu valley, a spectacular building adorned with traditional buddhist symbols and paintings. The gateway is guarded by two large statues of what seems like a cross between a lion and a dragon on either sides. 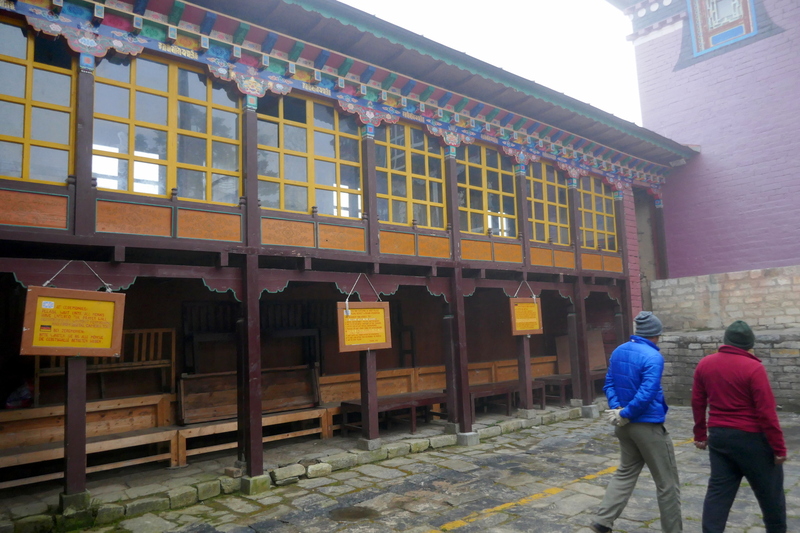 There are also five smaller prayer wheels and two large prayer wheels with bells on both sides of the entrance. According to the Buddhist tradition, you must pass to the left of prayer wheels, and if you decide to spin them it has to be clockwise. The large prayer wheels are in an enclosed rooms and have mechanism that ring bells when its spinning. After you enter the building, there is a large courtyard surrounded by assembly area upstairs and wooden seats downstairs. 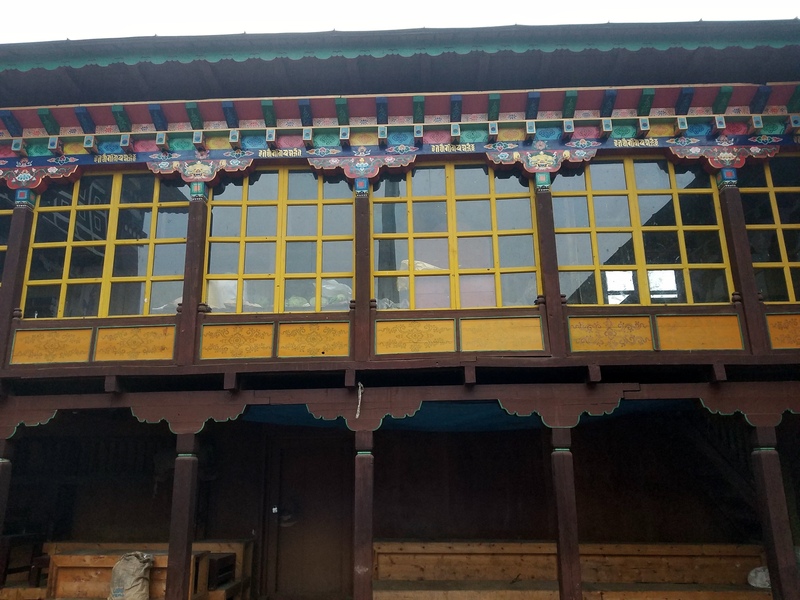 The wooden building is decorated with colorful buddhist mantras and floral motif. 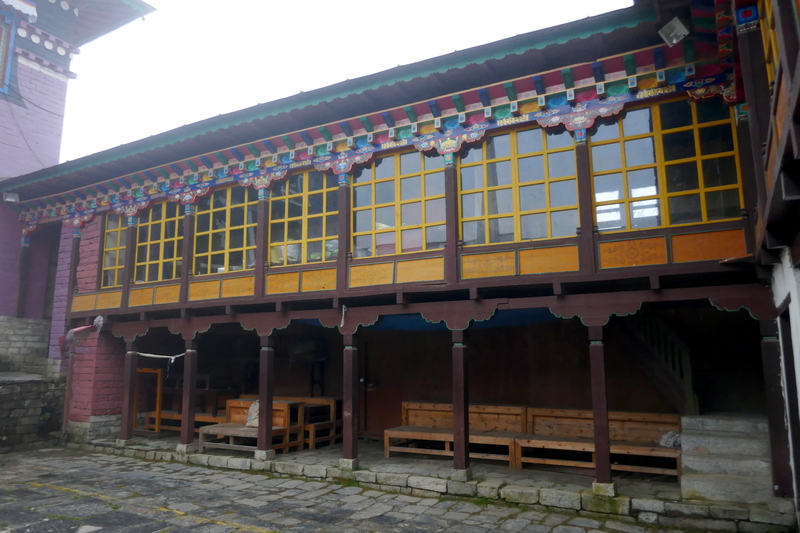 Panoramic view of Tengboche Monastery courtyard.Click for a large image. Stone stairway at the other end leads to the main prayer hall. 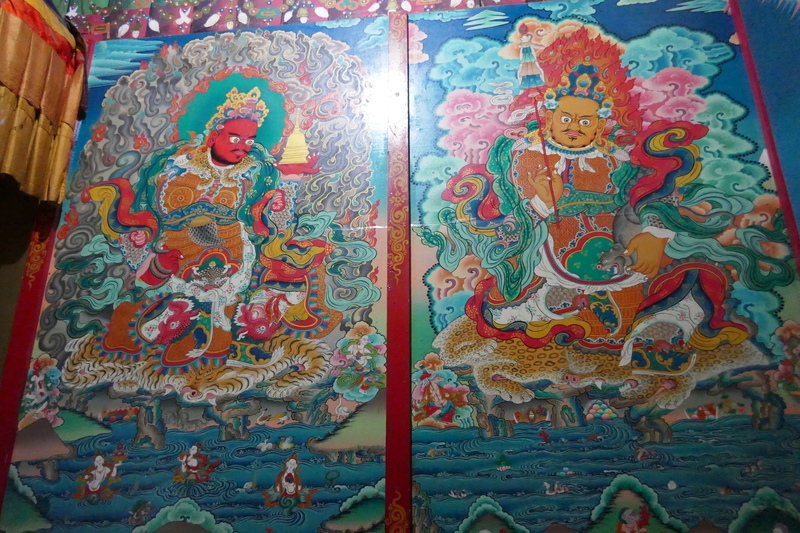 There is a small waiting area with large detailed paintings based on Buddhist mythology. 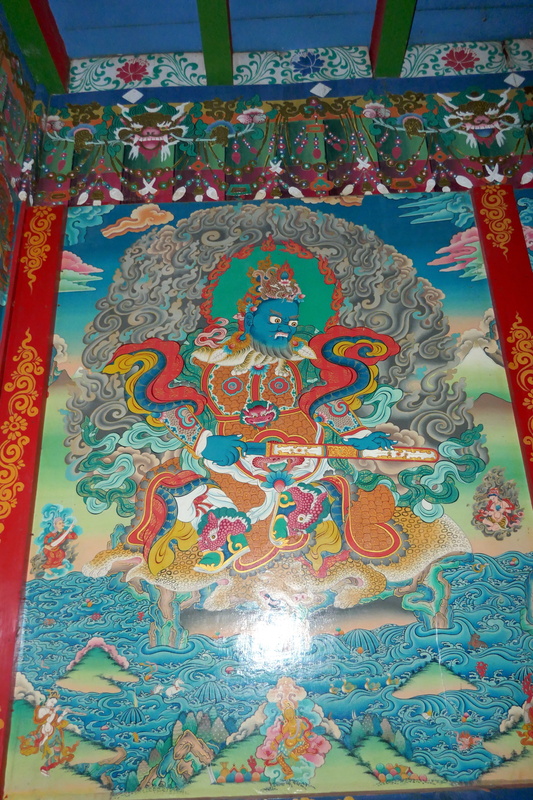 Buddhist mythological paintings, Tengboche Monastery. When we visited the monastery, the main prayer hall was closed and our guides went to look for someone to see if we can visit the inside of prayer hall. 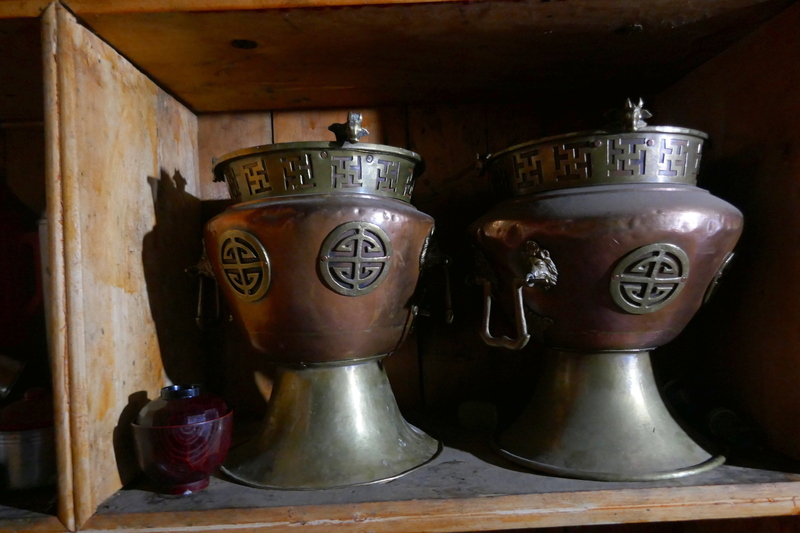 While waiting, we visited the Monastery kitchen on the right side of the courtyard – which is open for visitors. There were two people in the kitchen, one monk and a chef. 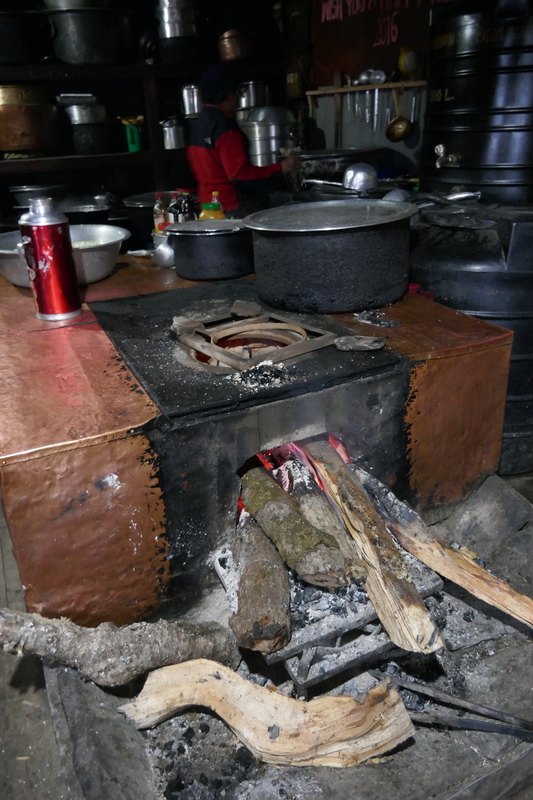 The dimly lit kitchen was well-organized with a wood fired cooking stove in the center and a large hood on top. 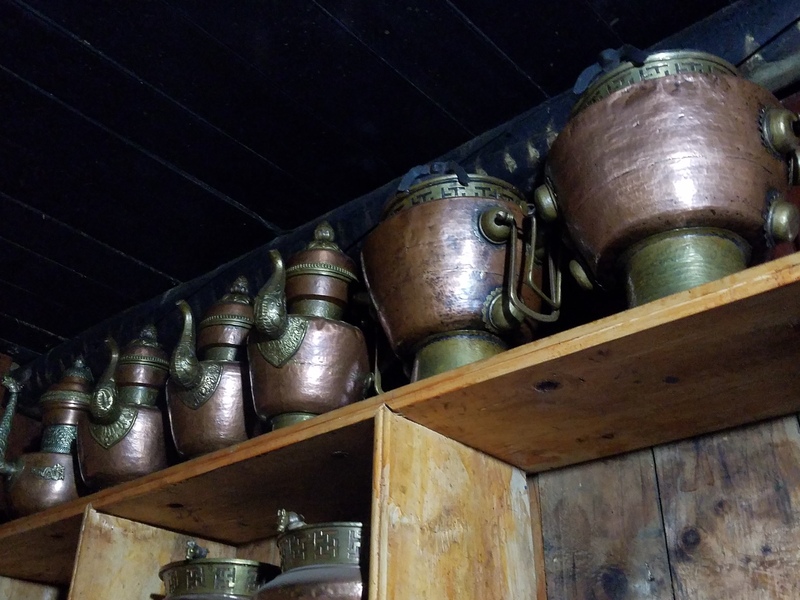 Large copper and aluminum pots and what looked like ceremonial tea vessels lining up the kitchen shelves. 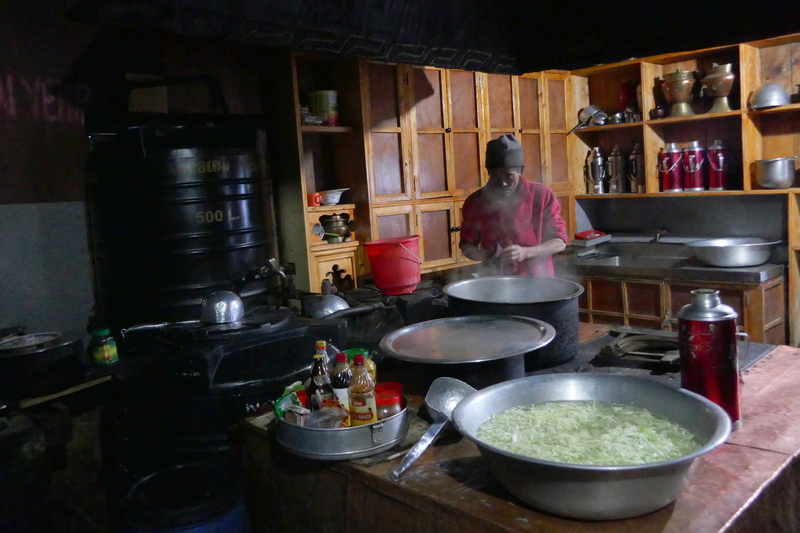 According to the kitchen staff, there were about 26 monks living there when we visited them. A chef was making stir fried vegetable noodles for dinner under supervision of a senior monk with a stoic face and piercing eyes. Our guides came back saying it may not be possible to visit the prayer hall today but we can visit tomorrow early morning during their morning prayer. So we decided to return to our rooms. Tengboche Monastery entrance with our hotel in background. We returned to our hotel and unpacked for the night. It was still early and we were not very tired (comparatively speaking) so we decided to hangout in the dinning room – the only warm place in the entire building. Our hotel, Hotel Himalayan, was much better than I anticipated. It was clean, carpeted, had windows with sliding glass doors (probably dual panned) and nice curtains. We sat in the dinning room drinking teas and chatting with other hikers. I talked with an Australian couple who was returning from the base camp and learned about their experience. Panoramic View of the Dinning Room. I wanted to do “digital detox”, to the extent possible, while on the trail but today was the first day I tried the internet using the hotel wifi connection to do a quick check in with my family and send a couple of photos from the trek. 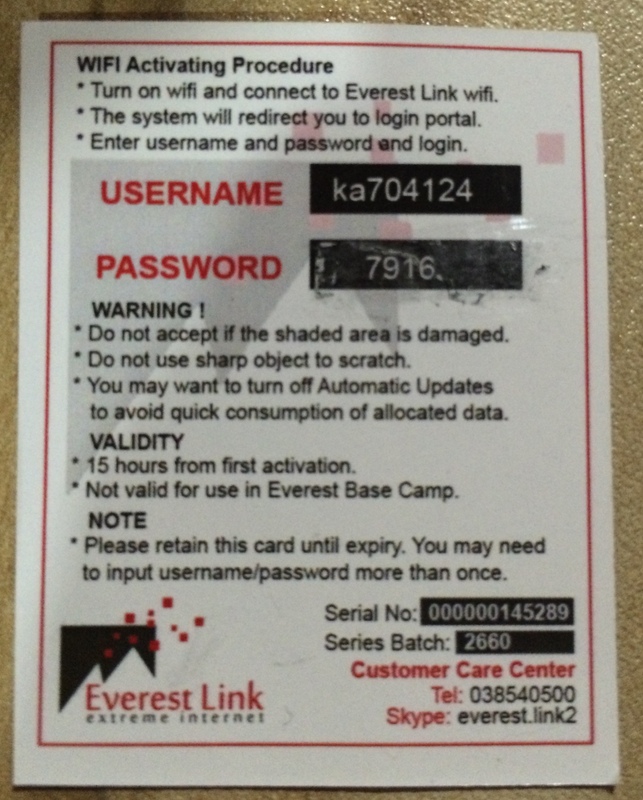 The way it works here is you purchase Everest Link card with fixed MB traffic allowance that is good for up to 24 hours. 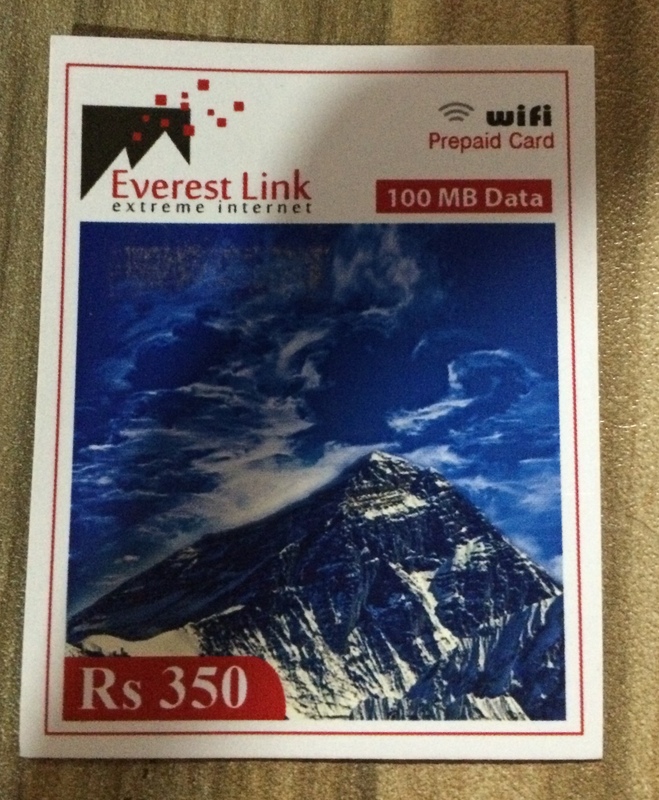 I purchased a 100 MB wifi card for NPR 350. Within five minutes of entering Username and Password from the other side of the card and barely sending a couple of messages, I get a notice saying I have used up all my data allowance! What? I was confused. Rush and Varun had used these cards before and informed me that I needed to turn off all other Internet-based features(Dropbox & Google drive sync, work and personal emails, auto updates, and other data hungry apps) as they used up all my 100 MB allowance before I could send a few messages via Whatsapp. So, I went and bought another card and after turning off almost all the other items I was OK using it for my purpose. After our usual Dal-Bhat dinner and reviewing photographs from our trek up to Tengboche, I went to bed.